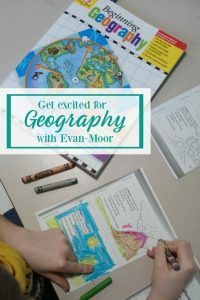 After we finished Kindergarten Geography my son couldn’t wait to jump into Evan-Moor’s next book, Beginning Geography. I was a little nervous about jumping in with a six year old but my fears were soon put to rest. He gobbled up the entire book! I’m not kidding. Bee would have done Geography all day long if I let him. I stopped him after 20 pages but he still continued to flip through the workbook just to see what he would be able to do the next day. I will admit that my son is a reader, however he is not a workbook reader. For all of our other workbook type lessons he simply puts the book away until the next lesson. Geography completely captivated him. 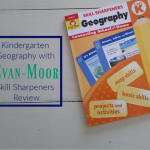 Earlier I mentioned that we previously used the Kindergarten Geography workbook and we loved it. I know that many of you do not have kindergartners any more and might be worried that you missed something by not starting with the first book. Breathe. 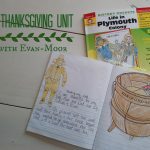 Evan-Moor goes over the same topics that we taught in the first book but they are able to cover the material quicker and will less repetition. You can start with the Beginning Geography workbook and have success. If you did use the Kindergarten book first you will notice a quick review. Kids learn through repetition so don’t wonder if this new book will be a stale. Evan-moor did a great job at leading a quick review/instruction then moving onto more challenging topics. 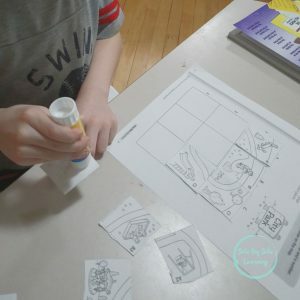 Instead of diving right into cardinal directions, Evan-Moor makes sure that kids understand the basic concept of left/right and up/down. They quickly build into using cardinal directions to locate objects on grids then maps. Map symbols, check! They teach a variety of official map symbols but also prompt kids to come up with their own symbols to help them decipher future maps. A big party of successfully using a map is making sure that you are using the correct scale. Finding the wrong distance can quickly lead you to the wrong direction. We used a regular measuring tape for the distance lessons but there is a rule included so you don’t have to look for any extra supplies unless you want to. We flew through this whole section! Not because it was boring or too easy but because my kid was sooo interested. I tried to slow him down by having him color the entire mini book but he still wanted me to read the next section while he colored. My only problem is that now I have to consistently break my kids heart that we aren’t going to the Grand Canyon next week. All you need to hit the ground running with this book is a pencil and maybe some glue and crayons to add some color. 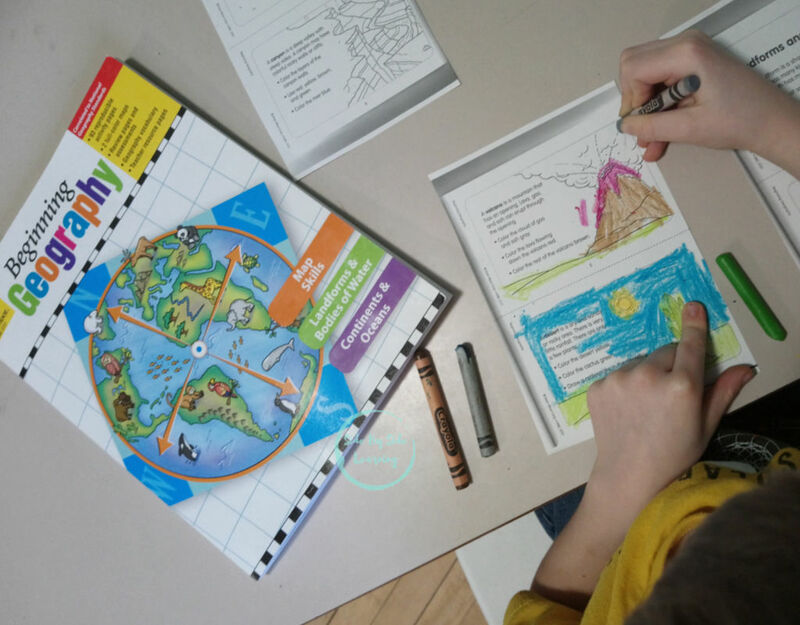 As a teacher, facilitator or parent you do not need to spend time preparing for your child’s beginning geography lesson. Simply sit down with your student and read directly from the book. Extra resources are included right on the pages so you don’t need to go on a hunt for a ruler, unless you prefer to. It’s really that easy, completely open and go. If you want to use this book for multiple students then I would suggest breaking out your copier. 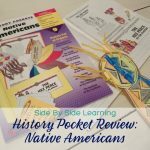 I choose to flip though Beginning Geography on the look out for activities I knew my son would really love so I could have extra copies printed and ready to go for him. The pages that I didn’t print off but required handwriting we used a Boogie Board that allows you to write on the worksheets without writing on the worksheets. I remember being bored to tears being forced to learn about geography. It was pain staking. All of the information went in one ear and straight out the other. Using Evan-Moor has helped me create a completely different outcome in our home. Geography is looked forward to everyday. When we are out and about my six year old recognizes the different landforms and is excited about it. He now uses his education as part of his regular play. He spends hours every week creating his own maps with legends that lead him around our home. I never expected a simple workbook to impact my son on many different levels but I am so glad that it did. Your post made me smile! Isn’t it the best when kids just soak up learning like that? Those are the moments I cherish in our homeschooling. We haven’t tried this book yet, but It is on our list. After reading your post, it looks like something kids would love to do – even during the summer months!